This past Sunday, January 13, 2013, the clouds parted, the angels sang, cyberspace was a twitter and some lucky members of the press and automotive community assembled on the eve of the 2013 North American International Auto Show in Detroit, Michigan, were treated to the world reveal of the 2014 Chevrolet Corvette Stingray. No other car manufactured by any division of General Motors has such rabid followers and no other GM nameplate is as closely watched. In its 60 year history, this is only the 7th generation Corvette. You will see it referred to as the C7 as car people will use this as shorthand to reference this or any generation of Corvette. The 2014 Chevrolet Corvette Stingray. As has been the tradition for decades, the Corvette is the platform for GM to show off its engineering expertise, hone its racing credentials and demonstrate its ability to whip up sheer desire in rabid fans of all ages. The stunning, all-new, completely redesigned 2014 Corvette Stingray replaces the current AARP-favored C6 that has been GM’s standard-bearer for nine long model years. However, even as it stands today, the C6 is the best car made by any GM division. Period. The first Corvette with the Sting Ray moniker (two words back then) appeared on the 2nd generation (C2) for the 1963 model year. Perhaps the most desirable Corvette EVER produced, the 1963 Sting Ray coupé had a split rear window, a feature that disappeared in 1964. Ask anyone interested in cars about their favorite Corvette, and almost everyone will cite the C2, and most likely the 1963 split rear window coupé. To this day, it’s my favorite Corvette and prime examples at auction routinely sell for $80,000 or much, much more depending on the option packages, provenance and level of restoration. 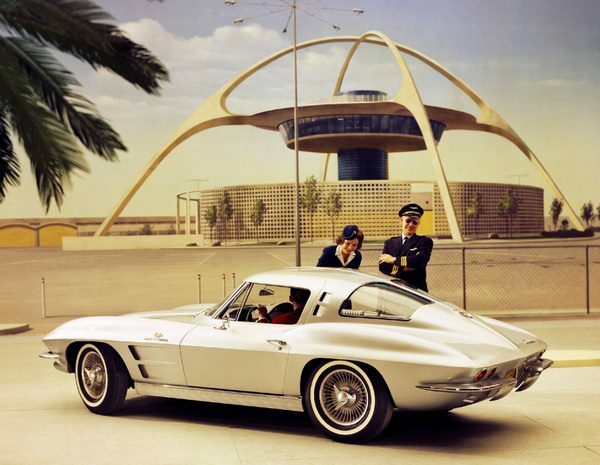 The mid-century icon, a 1963 Chevrolet Corvette Sting Ray Coupe in front of a Mid-Century modernist architecture masterpiece, the 1961 Theme Building at Los Angeles International Airport (LAX). 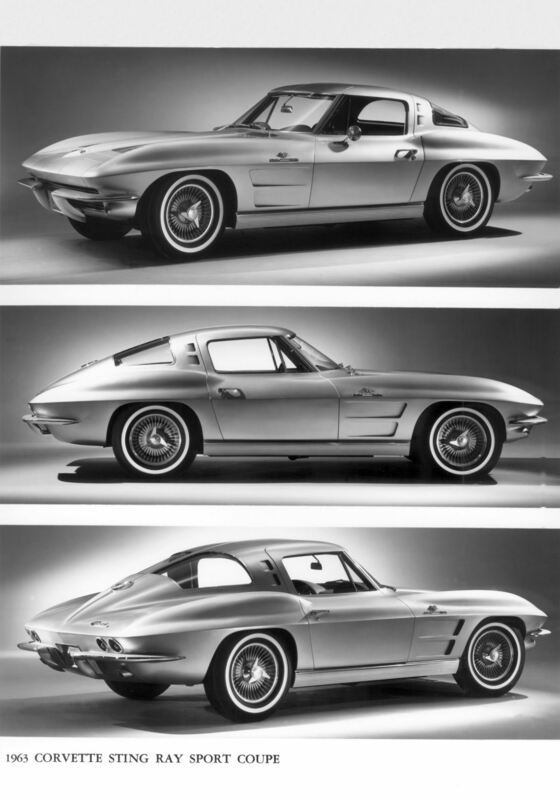 More press pictures of the stunning 1963 Chevrolet Corvette Stingray Sport Coupe. Every car magazine, website, blog and men’s magazine will feature the new Corvette on its cover or homepage in the coming days. And GM will get many more magazine covers and blog posts when Corvette press cars are distributed this spring to automotive journalists. The inevitable comparisons will be made between the 2013 SRT Viper and the C7 and most magazines will test it against a Porsche 911, Mercedes-Benz SL and/or more exotic cars like the Ferrari F458, Aston Martin Vanquish or the McLaren MP4 12-C. In short, there will be a plethora of PR or press coverage of the C7. I’ll be most interested in Dan Neil’s review in the Wall Street Journal. The rear of the 2014 Chevrolet Corvette Stingray is as dramatic as the front. It’s the first Corvette since 1963 that doesn’t feature two round taillights on each side. GM’s press release (below) says the C7 will go on sale in the third quarter of 2013. Prices have yet to be announced, but the base price shouldn’t be too much higher than the outgoing C6, which starts at $50,000. This is a Motor Trend video featuring the new C7 with interviews with the designers and engineers. The color of the car in this video is outstanding and the car looks sharp, fresh and dramatic (great lighting helps too). This is just what a Stingray should be. The 2014 Corvette Stingray is the most powerful standard model ever, with an estimated 450 horsepower (335 kW) and 450 lb.-ft. of torque (610 Nm). It is also the most capable standard model ever, able to accelerate from 0-60 in less than four seconds and achieve more than 1g in cornering grip. It is expected to be the most fuel-efficient Corvette, exceeding the EPA-estimated 26 mpg of the current model. Track-capable Z51 Performance Package including: an electronic limited-slip differential, dry-sump oiling system, integral brake, differential and transmission cooling, as well as a unique aero package that further improves high-speed stability. 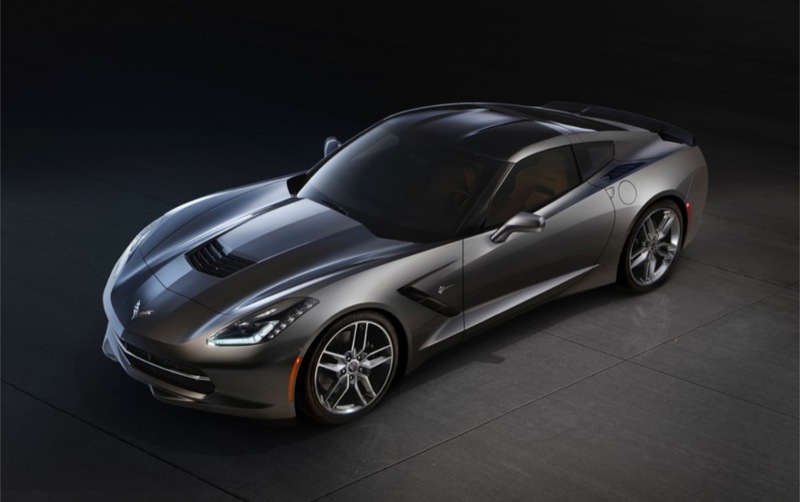 The 2014 Corvette Stingray coupe goes on sale in the third quarter of 2013. The smaller, 14.1-inch-diameter (360 mm) steering wheel fosters a more direct, immediate feel to directional inputs. The attention to the driver extends to the smallest details, including the flat, precise stitching on the steering wheel designed to provide a smooth, consistent feel. There’s even a micro-LED screen for the passenger’s climate control placed below the vent on the on the dash away from the performance features on the instrument panel. The two eight-inch screens offer excellent visibility in direct sunlight, with 650 cd/m2 of brightness for the one integrated into the instrument cluster and 1,000 cd/m2 of brightness for the one in the center stack, making it among the brightest screens in the industry. The screen in the center stack also features touch-screen control with gesture recognition and can be lowered to reveal a hidden storage that includes a USB input for device charging or uploads. The Corvette Stingray delivers an advanced infotainment system, featuring Chevrolet MyLink and high-definition radio, as well as enhanced OnStar with 3D navigation maps. An additional USB port in the center console, a stand-alone audio input jack and an SD card slot provide seamless connectivity. All models have a new grille/radiator arrangement and hood vents. Venting air out of the hood reduces total front-end lift for improved steering response at high speeds. The front fender side coves also help vent underhood air pressure to reduce aerodynamic drag. Models with the automatic transmission or Z51 Performance Package feature a functional vent on driver’s left side directing air over a heat exchanger for the transmission fluid and a similar arrangement on the passenger side that directs air over a heat exchanger for the electronic limited slip differential. The technologically advanced foundation is an all-new aluminum frame structure that is 57 percent stiffer and 99 pounds (45 kg) lighter. The greater torsional rigidity reduces unwanted noise and improves ride and handling. The innovative use of materials includes a standard carbon fiber hood and roof panel, as well as underbody panels created with carbon-nano composite technology, an advanced blend of traditional composite material and carbon fiber, which allows lighter underbody panels without a loss of strength or stiffness. Fenders, doors, rear quarter panels and the rear hatch panel are made with lighter-density Sheet Molded Compound than the previous generation. Combined, these materials save approximately 37 pounds (17 kg) versus the previous body structure. The lightweight elements of the Stingray contribute to the ideal 50/50 weight balance. Combined with its estimated 450 horsepower (335 kW), the new Corvette delivers a better power-to-weight ratio than the Porsche 911 Carrera or Audi R8. Those 450 horses are generated by an all-new LT1 6.2L Small Block V-8 engine, which produces an estimated 450 lb.-ft. of torque (610 Nm). More importantly, it generates 50 lb.-ft. more low-end torque than the previous 6.2L engine, matching the 7.0L LS7 engine from the 2013 Corvette Z06 from 1,000 to 4,000 rpm. While the Corvette Stingray retains the racing-proven short/long-arm suspension design, front and rear, the components are all-new. Improvements to the suspension include hollow lower control arms which save approximately nine pounds (4 kg) per vehicle and new aluminum rear toe links which save 2.4 pounds (1.1 kg) over previous steel links. This film was produced by General Motors sometime in the mid-1950s to “solve” the problem of traffic congestion in major cities. Just in case you were wondering, the plan didn’t work. Without seeing the pictures of mid-20th Century America, and with only minor tweaks to the script, you’d swear that it was a speech at a modern meeting of urban transportation planners. GM’s solution to the traffic problem was more buses produced by, of course, General Motors. GM wanted people to ride on one of their buses to work and for downtown shopping but still own at least one or two (GM) cars to park in their suburban carports to be used for off-time recreation, family shopping and errands. 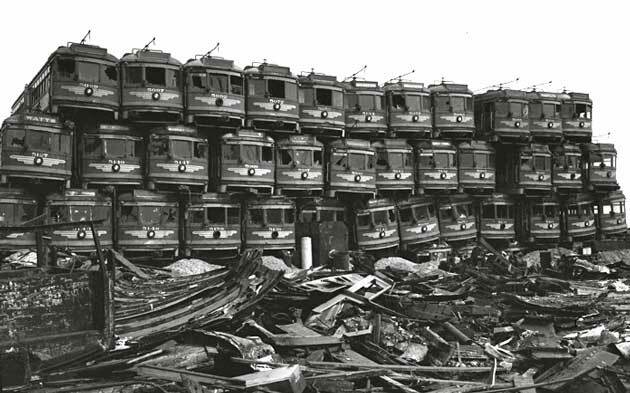 A pile of Pacific Electric Red Cars waiting to be crushed. GM’s reasoning sounds simple. People work and shop in congested downtown districts filled with highrises and streets that were built before the advent of the automobile. It would be very difficult and expensive to widen the streets and building downtown public parking would be expensive – up to $4,000 per space. Because of the burgeoning population, people were moving to the suburbs and as a result, they drove themselves to work, usually alone (sound familiar?). Studies at the time showed that the average passenger car carried only 1.5 persons. Even the 101 freeway, which was built to connect the San Fernando Valley to Downtown LA, had bumper to bumper traffic in the 1950s! One easy way to widen a street is to remove street parking and parking meters. That way, you gained one traffic lane each way to help relieve traffic; however, as the logic went, if we opened up another lane of traffic, it too would fill with cars unless public transportation, using comfy GM buses with air conditioning and air suspension, were placed into service. The first part of that assumption turned out to be true. Unfortunately the second part, public bus transportation, didn’t. GM estimated that for every bus, 34 cars would be taken off the road during commuting hours. With an extensive bus system, privately operated, municipalities and states would be able to dramatically reduce taxes as there would be no need for expensive widening of streets and motorways (what we now call freeways). GM saw no need for publicly-funded, inefficient and expensive public transportation systems (like the NYC subway) because private bus companies could easily earn a reasonable profit. Yeah, right. GM even argued that a bus company should even be taxed less than other businesses because they would be providing such a great public service that saved taxpayers so much money. Oh, if only this was true. To service the suburbs, GM advocated for perimeter parking – something still being built in Los Angeles today near new light rail and subway hubs. As the theory went, commuters would park in these lots and then ride the bus into the congested downtown business area. The parking lots would be much cheaper because land was cheaper in the ‘burbs – and it used to be. People would board a bus that leaves every five minutes (!! ), exit at a stop just a few steps or a block away from work/shopping and then apparently be able to catch a bus from downtown that got them back to the perimeter parking lot with equal alacrity. Not only that, but they would arrive at their destination well ahead of driving time. Unfortunately, that wasn’t true either. 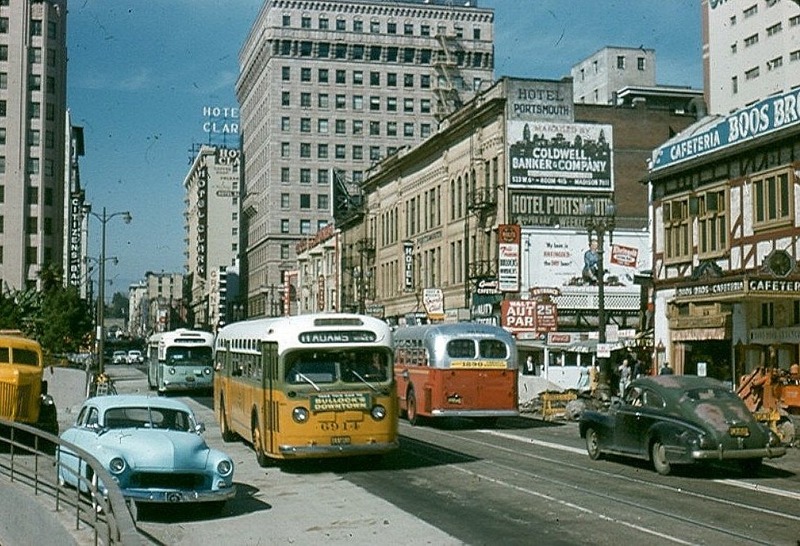 Downtown LA traffic and a bus from the 1950s. Los Angeles is still trapped in this illusion that buses are going to lead the way to alleviate traffic. Even the light rail we’ve built during the past two decades crosses city streets and is often halted by traffic accidents. When my parents bought their home in 1955 in Tarzana, they were just a stone’s throw from railroad tracks belonging to the Southern Pacific Railroad. They were told at the time that a commuter rail system would be going in there “soon” and that it would be easy for us to take public transportation. Fifty years later, that railway was transformed into the MTA Orange Line bus line. Just as GM predicted in this short film, there would be roads specifically dedicated to buses. The Orange Line runs lovely, modern accordian buses but it’s hobbled by the fact that it has to cross normal streets with crossing guards almost identical to ones still used by railroads. Naturally there are accidents at those intersections because drivers are either too distracted or too stupid (or both) to stop when they see the flashing lights. Under- or overpasses would have solved this problem, but it was too expensive to contemplate. At least the Orange Line is nicely landscaped and has lovely bike paths. Unfortunately, the Orange Line didn’t solve the cross-Valley and Warner Center traffic problem. What happened in Los Angeles and countless mega-cities across the country was that they were built to cater to automobiles. 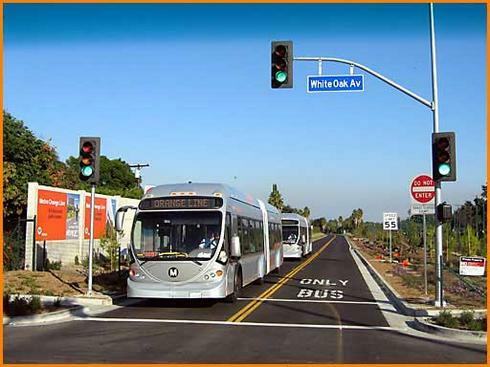 Los Angeles County is so large and so sprawled out that it would be impossible to provide bus service sufficient to significantly dent the surface street traffic. While buses help, they move just as slow or slower than normal traffic. Transferring to another line or route adds significant time to any trip. Also, Downtown LA is not the center of jobs and shopping. As with the population, centers of commerce also left downtown. You can work at Toyota in Torrance and live in Tarzana. No bus line, subway or light rail is going to get you there faster than a car. Something GM couldn’t have predicted is that we now live in a 24 hour economy. No longer is work from 9 am to 5 pm. If only! People work odd and long hours and many have to drive during work hours every day. No private company could run the MTA bus/rail/subway system for a profit and still have riders. People work from home and drive to meetings all day long. Private cars are now second offices. And for many, their daily drive has become their only private time. The 27 minute film, uploaded to YouTube, has flaws and sound problems. Stick with it, if you can, as it’s a fascinating history lesson. The pictures of mid-Century Los Angeles come on around 5:09. Now that you’ve had a good laugh of GM’s vision for the past, check out GM’s latest vision for the future. The EN-V (electric networked vehicle) concept sure sounds amazing, but one has to wonder how it would work in the snow. Any chance we’ll see this happen in LA or anywhere outside the Arabian Peninsula in the next 50 years?